In large bowl, mix dry cake mix and champagne. Add oil, egg whites and food color. Beat with electric mixer on medium speed 2 minutes. Divide batter evenly among muffin cups. In medium bowl, beat frosting ingredients with electric mixer on medium speed until smooth. Frost cupcakes. Sprinkle with garnishes. Store loosely covered. 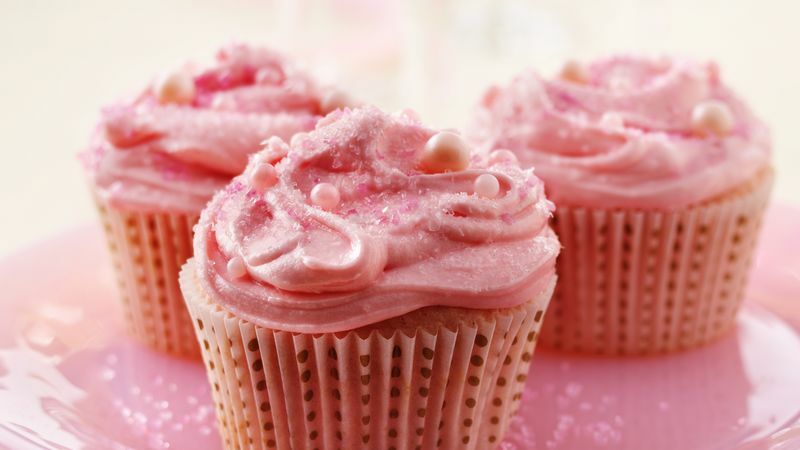 For pink decorator sugar crystals, edible pink pearls and decorative cupcake liners, check out fancyflours.com. Sprinkle garnishes on cupcakes just before serving to maximize sparkle and keep them from absorbing moisture and melting into frosting.